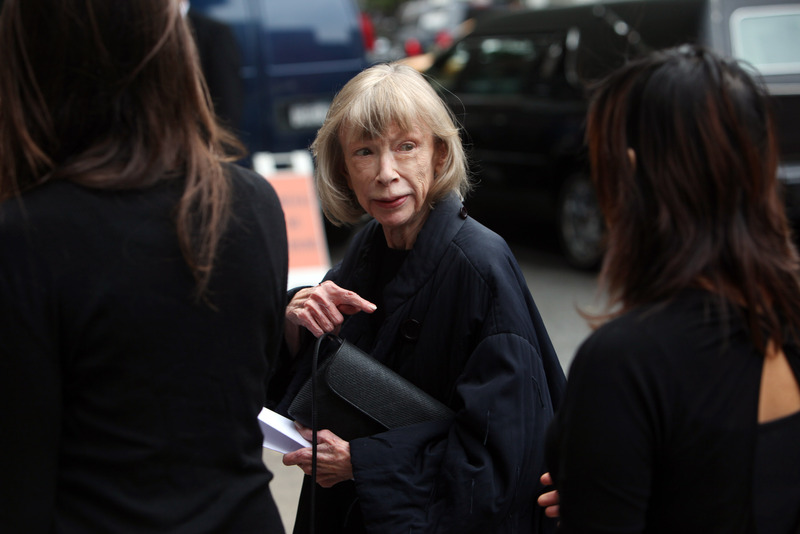 Joan Didion can't quit being so awesome. Céline just revealed the celebrated 80-year-old American author as the latest face for the brand. Prior to the big fashion reveal, Didion slid five novels under her sleek belt—in addition to 12 essay compilations and countless bylines in celebrated publications. Now, a Didion documentary is in the works and we couldn't be more excited. Why the giddy freak-out? Because Joan Didion is our champion, and in a life defined by so many moments, we couldn't be happier that she is certainly having another one this year. Her bravery shined as she openly parsed through her grief in losing both a husband and a child. She boldly studied hoards of teens in the Bay Area during the Summer of Love, long after she was a teen herself. She's never afraid to be wrong, or get hurt, or lost. She nailed identifying the raw fibers that compose self-respect. Then she mastered an explanation of how to weave those together to resemble something like a rope to hoist yourself up from whatever trouble you faced. One of the cool parts about aging is that a lot less registers as emotionally devastating. You now know you can survive, which is a priceless reassurance. However, that somewhat narcissistic feeling we all secretly feel in our early 20s can lend to testing creative solutions. That's the kind of skin-toughening that builds character and courage—something Didion knows, and articulates, so well. There's no use in trying to forget mistakes you've made, or phases of your past that you now maybe regret. It's all life, man. It all helped you become the person you are now, and will likely continue to fuel your growth into the person you're yet to become. Clutching a small memory of those incidents help keep you grounded—and prevent you from accidentally falling back into bad habits or scenes. Fear plays a major factor in preventing people from chasing (and getting) what they want. Didion suggests the hunt is worth pursuing, but only to those really dedicated to keep on going, even with bleeding heels. Once that thing is finally wrangled, it's bound to change. It has to. Didion and husband John Gregory Dunne met while she was an editor at Vogue in New York. She married the novelist in 1964 and the lit power couple stayed together until his death in 2003. You can't harmoniously stay with someone that long without a little zen trust, as Didion points out. Loss is a major theme across Didion's writings, most noteably in The Year of Magical Thinking and Blue Nights. She dissects the death of her husband in the former, the death of her daughter Quintana Roo in the latter. Life's cruelties may always seem random, unwarranted, and continue to catch you off-guard. However, Didion's most powerful quote helps begin to make sense of those cruelties. It offers hope. That's one powerful practice—writing. Thank the heavens Didion picked up that pencil to inspire us all to learn what we want and what we fear.